Anthropologie has been hitting it out of the park lately with the patterns on their skirts! 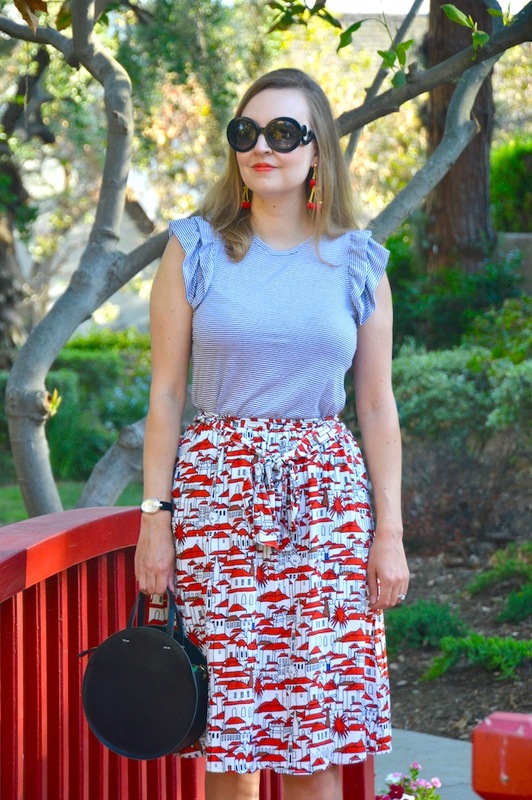 This "Getaway" printed skirt is one of several skirts I bought there this summer. In fact, I bought it at the same time that I purchased my sunbather skirt, which I featured a few days ago on my blog. If you look closely at this skirt, the pattern is a myriad of houses and buildings accented in red with just a touch of blue. 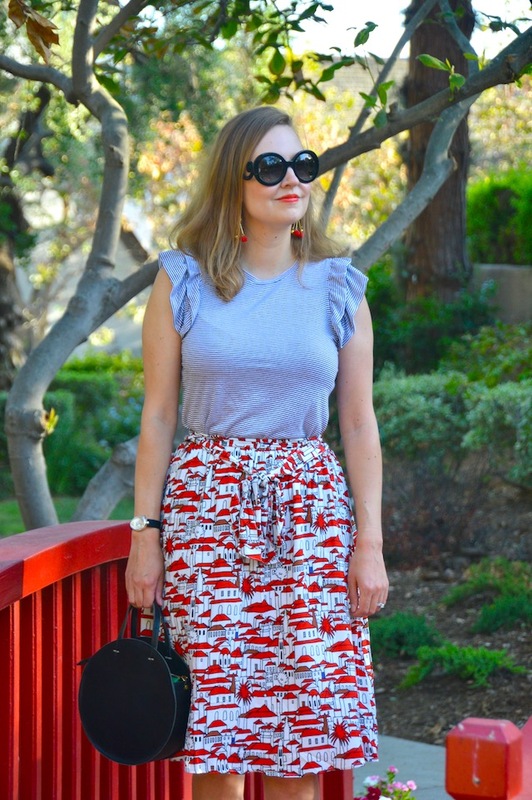 As I was looking up the skirt online in order to write this post, I noticed that it also comes in several whimsical prints and now I have my eye on the zebra and fish versions of it! Maybe if they go on sale I'll get one...or maybe even two? In case you were wondering where these pictures were taken, I'm standing on the bridge where my husband and I were married a number years ago. In fact, we just celebrated our anniversary this month! Although these pictures were taken a couple of weeks before our anniversary, we did have a very special dinner at the restaurant at the hotel here. (I guess it was sort of a pre-anniversary celebration!) We had another lovely dinner on the actual day of our anniversary, so as you can see we've been eating well this summer! Luckily, this skirt has an elastic band so you don't have to worry about indulging in a little extra risotto or dessert! Labels: Anthropologie, Circle Bag, Clare V.
That's such a cute skirt and I really like the stripes and ruffled top with it! :) I think you should definitely get this in more prints if they go on sale, it's a nice skirt on you. I love that you used primary colors in this look. The blue and red and yellow really pop! Such a pretty outfit. I love the pattern mixing. That top and skirt are so cute, and what a perfect spot for photography. How sweet the history behind that bridge. Happy Anniversary. Pretty outfit Katie! I buy a fair amount from Anthropologie, thrifted on Poshmark. Love the skirt and the flutter tee. I am a big fan of circle bags too. Happy Anniversary to you and your hubby!